Timberlane’s administration appears to inhabit a state of chronic capital confusion (sorry, couldn’t resist the alliteration) about which budget accounts constitute capital expenditures. Last year, during a School Board discussion of the default budget, Donna Green argued that the Site and Facility Improvments lines, as capital projects, should be considered one-time expenditures and excluded from the default budget. The administration told the school board that these are not capital expenditures. This topic arose again during the Dec. 21 school board meeting, again during discussion of the default budget. The administration led the school board to believe that replacement equipment is not part of capital expenditures. Again, it was Donna Green making the point that funds appropriated for replacement equipment form part of the capital budget, and could be redirected if necessary for site and facilities improvements. We can see how this plays out by looking at the most recent annual report, for 2015/16. Page 31 of the report shows that the final voted budget for 2016/17 was $70,194,990. Page 41 of the report gives the apportionment calculation – of the $70.2 million appropriation, $65,883,768 is considered operating expenditure, and is apportioned amongst the 4 member towns based on student enrollment (Average Daily Membership). The remaining $4,311,222 is considered capital expenditure, and is apportioned based on Equalized Property Value. But how does the district arrive at the $4.3 million capital? Line 4200 – Site Improvements, is capital. Line 4600 – Building Improvements, is capital. The new equipment and new computer equipment lines (object codes 733 and 734) total $243,569. Capital. The replacement equipment and replacement computer equipment (object codes 737 and 738) total $608,852. Capital. Where’s the confusion? Manufactured confusion can often be advantageous. Will the same confusion arise when the district apportionment for 2019 is being calculated? Timberlane’s Cost Per Pupil (2016/17) was $16,780. That’s up by more than $1,000 from the previous year. Since 2008, the Per Pupil Cost is up 59%. Let’s contrast that with the comparable school districts. It’s concerning that Timberlane is $1,400 per pupil more expensive than the state average. It is appalling that Timberlane is $2,500 per pupil more expensive than districts of similar size and school configuration. Taking an example – Salem is similar in enrollment, school configuration and demography to Timberlane. It has stronger SAT scores in both English and Math. Its Per-Pupil cost is $1,934 less than Timberlane. 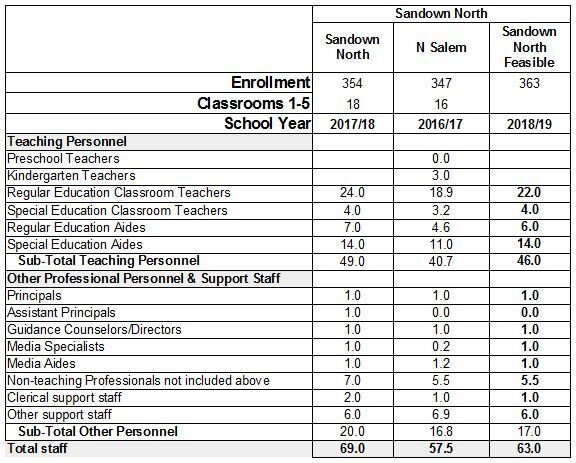 If our per-pupil cost were the same as Salem, our budget would be lower by $6.7 million. It appears that Timberlane’s Budget Committee is trying seriously to come to grips with the issue. Last week they approved a flat-line budget to be sent to public hearing. Tonight the School Board will be determining the Default Budget. In a turn of events last night that gives one cause for hope in local elected officials, the Timberlane Budget Committee voted no increase in the 18-19 budget . The vote was a remarkable 8-1-1. Mr. O’Neil opposed and school board representative, Dan Guide, abstained. Mr. O’Neil was holding out for a lower number. Be still your beating hearts! There will be a mighty fight at school Deliberative (Feb. 8, 2018) by parties who will motion to increase the budget. (The maximum increase allowed by law is 10%.) This is why your school board will be very concerned with getting an honest default budget number to the voters this year. The default budget number cannot be changed by a vote of the public body at Deliberative. Only the school board controls that budget. Come March, voters in the Timberlane towns have a chance, just a chance, of having a real choice in funding the school system – something intended by legislators and something undermined by less than honest default budgets of past years. Kudos to the budget committee for finally standing up for our beleaguered taxpayers and demanding better fiscal management. What Can Be Learned from SAT Scores at Timberlane? At last night’s school board meeting, Mrs. Collins, the head of the Timberlane Music Association, shared with the board some very interesting SAT results from our Timberlane students. Mrs. Collins said that Timberlane students who participated in music and athletics had higher test scores than the general student population. I found this information very interesting but it had never been shared with the board; furthermore, I had understood that SAT results are reported to school districts without personal identifiers. I asked Mrs. Collins the source of her information. She replied that Plaistow representative, Peter Bealo, gave her this information. Mr. Bealo then volunteered that he was able to determine this from data presented at a Curriculum and Assessment Committee meeting. Like many things, this data was not passed on to the general board. Given how highly significant the information, I intend to obtain the same information apparently available to Mr. Bealo so I can understand why I was so mistaken about the nature of the SAT reporting. Thanks to Arthur Green for another useful Right to Know request, which also includes a request for extremely necessary financial information; namely, the budget for the salaries in the 18/19 draft 2 budget. It does get tiresome that we have to inconvenience ourselves and pay for information that should be of keen interest to all district elected officials and freely available to the public. The SAT results data set referenced by Mr. Bealo at the SB meeting on Dec. 7, providing disaggregated results relating SAT scores to other elements of the test-takers’ course of study and extracurricular participation. It was not clear which year Mr. Bealo was referencing, but I would like to have the equivalent data sets for 2015, 2016 and 2017. If there are similar data sets covering AP results, I would like to have those also for the same 3 years. I will drop off a thumb drive at the SAU office for electronic delivery of these documents. Metzler Wants to Shed 81.5 Jobs. Is he wrong? In response to a board request to keep the budget flat and reduce it by our regular surplus, Superintendent Metzler has suggested laying off 20 support staff, 11.5 administrators and 25-50 members of the Timberlane Teachers’ Association. That is a maximum total of 81.5 full-time equivalent positions. The public reaction has been swift and sharp. The superintendent has been accused of being deliberately hurtful out of spite. You don’t want to support my budget? Fine, I’ll slash and burn! Memories of “closing” Sandown Central spring to mind. This time, the superintendent is on to something, maybe in spite of himself. Superintendent Metzler has opened up the secret of Timberlane’s extraordinary cost to taxpayers for all to see. ($20,000 per student per year.) What the elected officials have to do now is insist that long overdue staffing cuts are done with a minimum of unemployment costs so that our dollars are going to education and not avoidable benefits. 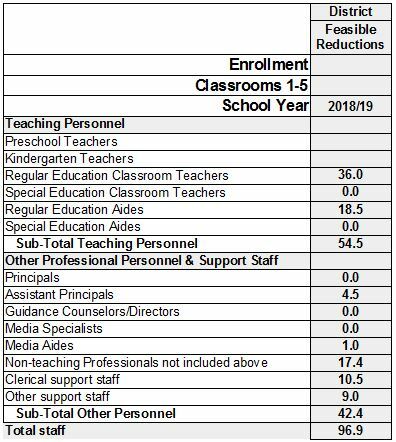 It should be possible to do most of the teacher workforce reductions by attrition, and the maximum number of teacher positions up for cutting should be closer to 36, not Dr. Metzler’s 50. By memory, we had close to 40 new teacher hirings this year, which means there is sufficient turnover in teaching staff for reductions by attrition. Administrators are on year-to-year contracts so no unemployment benefits are owed there with sufficient notice. The public should not be afraid of badly overdue workforce reductions. Management excellence that produces good fiscal discipline also produces educational excellence. Via a Right to Know request, Arthur Green obtained the most recent staffing reports filed with the state Department of Education (16/17) He compared this information with Timberlane’s current (17/18) staffing report to the DOE, also obtained via Right to Know. (The difference in the years had to do with the availability of enrollment figures for all districts.) When comparing schools of similar size and mostly in districts with similar or better academic results at the 11th grade level, he was able to directly compare number of classrooms and staffing levels. By Mr. Green’s calculation – and without touching any of Timberlane’s special education staffing – TRSD can lose 96 full-time equivalent positions and still leave all of Timberlane’s schools more generously staffed than comparable schools. Cutting 96 FTEs is feasible without affecting any special education teachers or aids. A total staffing reduction in the range of 40-50 FTEs spread over different job categories is easily achievable in one year. You will never hear these facts anywhere but here: Timberlane’s student enrollment has declined by 24% in ten years (1100 students), but our staffing has decreased by just 3%. Timberlane’s cost to its towns has gone up 36% in those 10 years. It has long been my conviction that management practices that result in good fiscal discipline also result in good educational outcomes. A clip from the last school board meeting on Nov 30, 2017 shows the superintendent expressing “great concern” over his reluctantly proposed budget cuts. The discussion should not be missed. Your school board has indicated it wants to cut administrators and the budget. Even though we regularly see surpluses in the $2 million range, a suggestion that we hold flat our budget and cut it by our surplus was met with screams right out of The Shining. And of course, any staffing cuts would be disastrous to education, that just goes without saying though many have to say it over and over because a lie often repeated has a chance of being confused with truth. This blog has been reporting for four years that Timberlane is hugely overstaffed. We can prove it six ways to the Overlook Hotel. Bedford is one of the best school districts in the state. 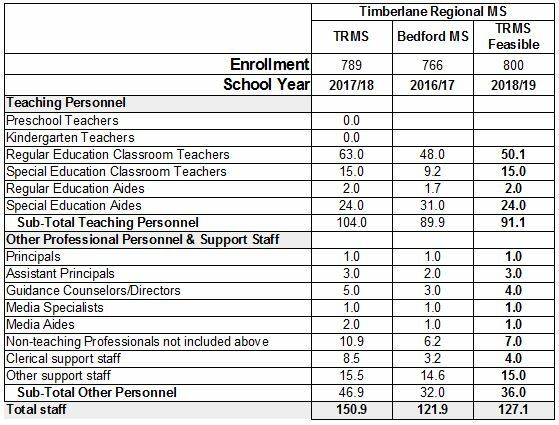 Timberlane would do well to aspire to Bedford’s results and could start working towards that by reproducing its evidently excellent staffing model. Would this mean Timberlane has to hire more teachers and support staff? 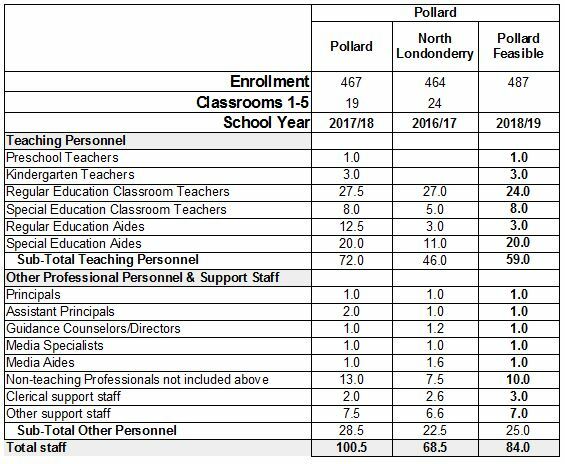 Well, here’s the shiny, bald truth: Bedford has 334 more students than Timberlane Regional High School, yet has just 7 staff more. When you adjust Timberlane’s student/teacher ratio to that of Bedford’s, you find that we could easily lose 13 teachers in the high school alone and still aspire to the highest of academic outcomes – with leaving our special education staffing completely untouched. 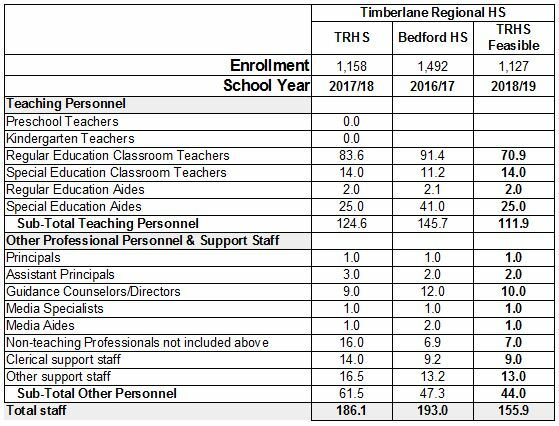 Timberlane high school’s total staffing needs to come down 30 full-time equivalent positions to approximate Bedford’s staffing model. The comparison is equally shocking when we look at our elementary schools. North Salem Elementary has the same number of students as our own Atkinson Academy. Atkinson also operates one half day pre-k classroom. 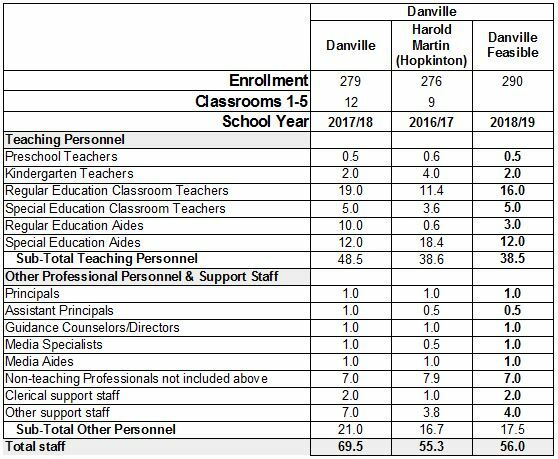 So, you would expect the staffing levels in both schools to be similar though Atkinson would have .5 of a teacher and .5 of an aid for the Pre-K program. Instead of being similar, however, the two schools aren’t even close. 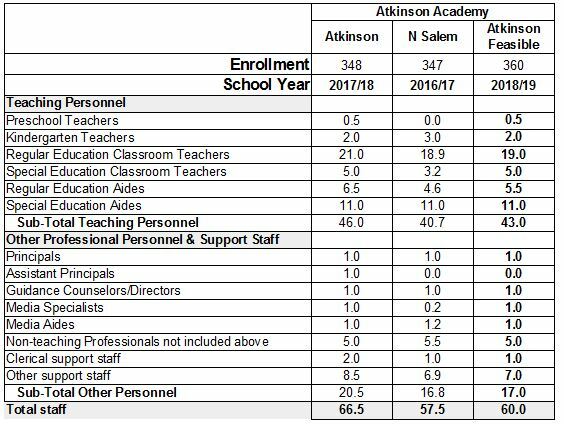 Atkinson has 9 more staff than N.Salem. When you adjust that for the extra two half time positions, Atkinson is over staffed by 8 full-time positions. (Only 3 of these are teacher positions.) For a school with 348 students, this is staggering difference in staffing. Pollard is an even more dramatic case. The undeniable truth is that Timberlane schools are demonstrably overstaffed not just in administration but in teachers and other positions as well. Tax bills came to our doors in the past few weeks shouting, “Wendy, I’m home!” Unfortunately taxpayers can’t lock themselves in the bathroom. What we can do is support the budget committee and the school board in pushing back against baseless histrionics. Timberlane towns can no longer afford a school district that sees itself as an employment agency rather than an operation responsible to the taxpayers for delivering a quality product efficiently. To be clear no one is proposing we cut this many positions in one year, but there is no doubt some cutting is necessary and should not be met with predictions of Armageddon. Too many of the arguments in public education use students as a cloak for very adult interests. Don’t be fooled. It’s all about jobs and empire building. Doing more with ample but sensible resources will be done only when you insist on it. Many dream of moving to a lower tax district and prefer that fantasy over attending a school deliberative session and the social discomfort that may entail. Just remember that lower taxes are not against the interests of education. In the most academically successful districts in NH, with only a few exceptions, good fiscal management goes hand in hand with good academic outcomes. Disciplined management carries its excellence into all areas. Support Timberlane’s school board and budget committee in their cuts this year. Attend school deliberative session to protect those cuts from those organized few who would reverse them. Do you want to live in dread of your tax bill every year?